The story of the SEC Championship Game is how close it came to becoming a very different event. Auburn QB Cam Newton, the prohibitive favorite to win the Heisman Trophy, was temporarily ruled ineligible for this game because his father demanded a substantial amount of money from schools that wanted Newton to attend. In a reversal that opens up a serious loophole, Newton’s eligibility was restored because it was ruled that he had no knowledge of what was going on. It’s certainly possible that that ruling will change with time, but the important thing is that Newton will be available for this game, and for the BCS Championship Game if Auburn wins here. The stakes for this game are easy to understand. If Auburn wins then they are playing for the National Championship. If South Carolina wins then Steve Spurrier finally makes it to the BCS. A win would be a huge boost to either program - neither has enjoyed quite the success that a win here would bring them. The marquee matchup here is Newton vs. South Carolina running back Marcus Lattimore. Newton just keeps getting better. He has completed more than 70 percent of his passes in the last month, and in his last four games he has thrown for 11 TDs and just one interception. He’s in a serious zone. Lattimore is just a freshman, but there isn’t a freshman in the country that carries a bigger offensive load for his team than he does. The consistent factor in the three games that South Carolina lost was that Lattimore didn’t get established early and he wound up not carrying the ball much and not piling up a lot of yards. This game gives us something rare in college football - these teams have already played each other this year. That game came on Sept. 25 and Auburn came out on top, 35-27. Three things stand out when you look back on the game. First, Newton was ridiculously effective against the South Carolina defense - he passed for two TDs, and ran for 176 yards and three scores. Auburn ran for more than 330 yards on the day. Second, Stephen Garcia was comfortable passing for South Carolina - he completed 70 percent of his passes for 235 yards and three touchdowns. That’s good news for the hopes of the Gamecocks because Lattimore was ineffective - he managed just 33 yards in 14 carries. Auburn was favored by three at home in that one, and the game easily went ‘over’ the total of 49. The game is widely available with Auburn favored by 5.5 points, according to college football odds. It’s significant to note that since this is a neutral-site game there is no home field advantage factored into the line, so this number is more significant than it could be. The game opened at five, and is showing signs that it could move up to six. It seems very likely that the spread will stay below a touchdown unless there is significant late money on the game. More than 60 percent of bets have been placed on Auburn. The total opened at 61 and seems stable at that point. Auburn has covered their last five conference games. They are 4-1 ATS in their last five as favorites. South Carolina is 4-1 ATS in their last five against teams with a winning record, and 4-1 ATS in their last five games as an underdog. They are just 2-5 ATS in their last seven games following a straight up win. The ‘over’ is 5-2 in the last seven conference games for both teams. Auburn has covered three of the last four meetings, but that doesn’t mean much - before the September meeting these teams hadn’t played since 2006, and have only played four times since 1997. Auburn is getting all of the attention in this one. It’s important to note, though, that South Carolina is worthy of some respect. They have scored a lot of points, they move the ball well through the air, and the defense is sound - especially against the run. They have lost three games, but two of those were against good opponents, and they did beat Alabama in impressive fashion. 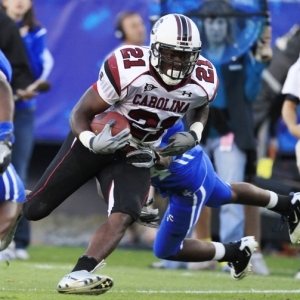 A lot of people aren’t giving South Carolina a chance, but they certainly deserve one. All that being said, I can’t see a way to avoid going with Auburn here. They have already shown they can beat South Carolina, they have improved as the season has gone along, and Cam Newton couldn’t be more confident as he leads this team towards the big prize. South Carolina is good, but Auburn is bigger, faster, and far more explosive. If the spread were more than a touchdown then I would have to pause, but at this level there’s only one side in my eyes. The total is tighter, but both teams like to go ‘over,’ so I would lean that way even though it is clearly inflated by public attention. Doc’s Sports has become known in nearly four decades in the sports handicapping business as one of the brightest and most successful college football handicappers in the nation and Doc has helped their clients earn a profit in eight of the last nine weeks ($100 bettors made $8,800 during that stretch). A 6-Unit Big East Game of the Year highlights a strong weekend card. Here at Doc’s Sports we provide both college football picks and NFL picks in one package so you can get the best of both worlds for all your football betting needs. Check our homepage for up-to-the-minute college football odds and daily exclusive college football betting articles.